恐れ入りますが、このホテルに関する詳細はまだ日本語に訳されていません。 You don’t go to Ritz-Carlton to have all your ideas about hotels turned on their head. You go to Ritz-Carlton to see the virtues of traditional hospitality practiced at the highest level. This is particularly true in Vienna, a city with a lot of time for the sort of neoclassical splendor that’s a Ritz-Carlton specialty. This is not to say that the Ritz-Carlton, Vienna offers nothing in the way of surprise; it’s simply to say that the surprises are largely in the details, rather than the concept. 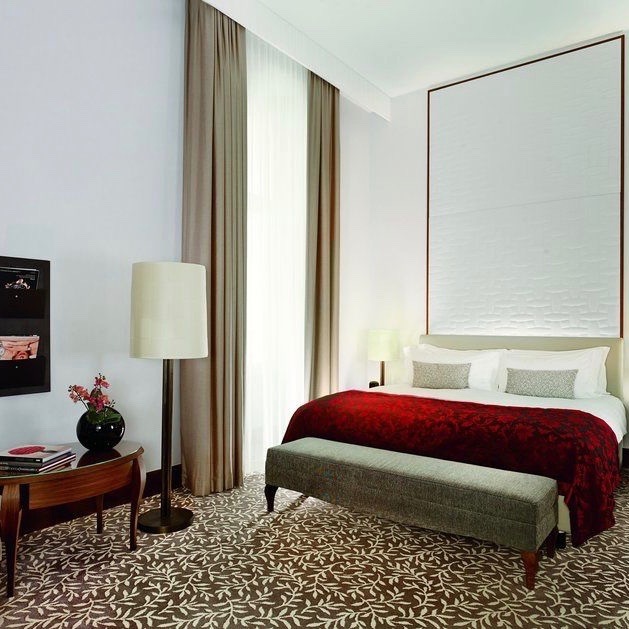 It’s made from four 19th-century palaces stitched together, spanning over two hundred rooms and suites, and while it’s situated right on the busy Ringstrasse, the atmosphere inside is calm as can be. (The atmosphere outside is another story — Atmosphere is the name of the rooftop bar, and given the views, “inspiring” might be a better adjective.) The accommodations are perhaps a touch more contemporary in style than the historic architecture might suggest, and the in-room comforts are naturally first-rate, from modern electronic gadgetry to timeless pleasures like heated bathroom floors and double-glazed soundproof windows. The spa, by Guerlain, might be even more impeccably composed than the hotel’s rooms, and the 18-meter pool, complete with underwater music, is the longest in Vienna. Add DSTRIKT, a farm-to-table steakhouse, as well as a cocktail bar, a lobby lounge and the aforementioned Atmosphere rooftop, and you’ll see that the Ritz-Carlton is more than adequately holding up its end of Vienna’s social life.